Made from pure copper and designed to clip over a 1/4 binding post. Crimp connector to cable (10ga. to 12ga. ), slide the shrinktube over the connector extending onto the jacket of the cable. Priced per 1 pair. 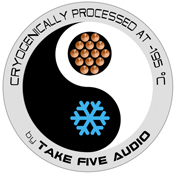 This part has been Deep Cryo Treated by Take Five Audio, click HERE for full details on our process.